A Yoga Pose for Your Amazing Hips and Back - nurture. Your body has an amazing capacity to adapt itself for pregnancy and birth. As the hormones of pregnancy relax the connective tissue throughout your body, your joints, including those in your pelvis, become more mobile. This is a good thing for birthing a baby. But it may cause challenges during pregnancy that can range from transient discomfort to truly debilitating pain. Things that you could “get away with” when your joints were a little less mobile – like long periods of sitting or standing with your weight on one leg, or my ultimate favorite, holding a baby on one hip – may cause hip and lower back discomfort now. 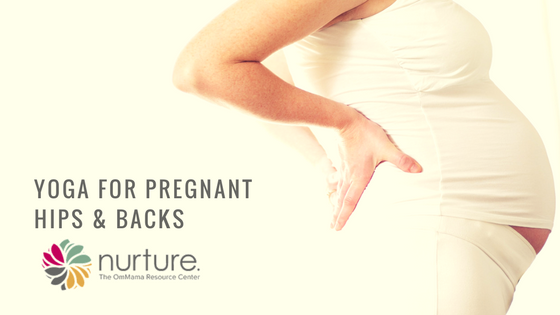 In addition, once you hit the late second trimester, the weight of the baby and uterus tend to tip your pelvis forward and up, which tightens the piriformis muscles that cross from the sacrum to the outer femur, and puts additional pressure on your low back. Sciatic joint problems, often referred to as SI joint discomfort or dysfunction, are also common in pregnancy due to the combination of ligament laxity and postural imbalances. SI joint discomfort is often expressed as a dull or sharp aching on one side of the lower back, just below the waist, in the little dimple you can feel when you place your finger about 2 – 3 inches below your waist, and about an 1 – 2 inches out from the center of your sacrum. Here’s a great yoga pose that can help prevent and/or relieve low back pain and SI joint discomfort, while also lengthening your entire spine. Plus, you can do it just about anywhere, even in a skirt! Use a ledge, wall, chair, bench, table – whatever is handy to provide a little additional support and balanced feedback. This pose stretches the hamstrings, lengthens the spine, and relieves pressure on the floor of the pelvis caused by the weight of the baby. With specific modifications, it can also help relieve pain caused by instability of the sacroiliac joints. A great stretch to do several times throughout the day to refresh the muscles on the back of your body. Stand close to a chair, (or window ledge, kitchen counter, etc.). Bend your knees, place your hands on the chair and walk back until your legs are approximately perpendicular to the floor. Pigeon toe your feet slightly so that your heels are a little wider than your little toes. Press down evenly through the inner and outer edges of your feet as you lift the fronts of the thighs up. Press your top thighs back, reaching your sitting bones (the two hard bones you can feel beneath your hand when you sit) up and back. Lift your baby up toward your spine so that the front and the back of your body stretch evenly. If you are experiencing sciatic joint discomfort, isometrically press your inner thighs toward your outer thighs, while staying evenly grounded on the inner and outer edges of your feet. Hold for 7 – 10 breaths, breathing steadily as your hamstrings stretch and your spine extends. You may feel some broadening in the area of the SI joint, which is what this action is designed to do. You are using your femur bones to help create a little traction to balance unevenness in the sciatic joint. To come out, bend the knees and walk in toward the chair, using your abdominal muscles to support your back as you stand up. What if: My lower back rounds in this pose. Your hamstrings are probably too tight to allow for full extension in the lower back. Try bending your knees slightly while continuing to lift the sitbones up and back, creating a slight natural curve in your low back: your hamstrings will still get a stretch without compromising your lower back. Partners can help by placing their hands at the very top of your partner’s thighs and pulling back gently, or if you’re comfortable in full Downward Dog Pose, s(he) may use a strap to apply gentle backward traction to the femurs. If this does not create more comfort in your hips and back, or if you have any pain or discomfort that interferes with the activities of your daily life, please seek the help of a qualified chiropractor or women’s health physical therapist. Leslie Lytle, MS, CMA, LCCE, ERTY500, RPYT, has taught prenatal and postnatal yoga since 2000.